This Easter, I wanted to take a break from the typical "Pastel Easter Decoration" project and make something new and fresh. Something that would reflect the coming of spring, nature, and a bit of shabby chic. I'm so happy with the end result, this darling vignette. It starts with a simple, shabby chic hall tree type piece of furniture. Easy to assemble and with chalk paint, easy to finish too! 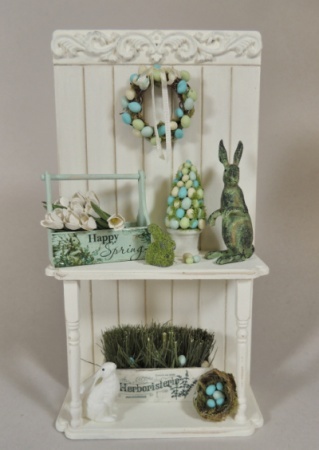 I created a darling little easter egg topiary tree, and a matching wreath. A wooden garden tote is filled with beautiful white tulips. A little moss covered bunny sits nearby. And my favorite part of the project, the grand garden rabbit. We 3D scanned this from a very large original, and painted it to match, with a beautiful antique cast iron patina. The blues and greens in the pallette I used for this project were so much fun to work with! And such a nice change from all those easter pastels! The lower shelf contains a wooden planter box filled with grass... look carefully you will see a few hidden eggs. A darling nest is filled with eggs, and a beautiful lop eared rabbit stands guard on the opposite side. This piece would be beautiful displayed in a dollhouse or roombox as an interior OR exterior piece. It also makes a lovely stand alone decoration for under a dome. THis pieces measures 6 1/2" tall x 3 1/2" wide. All materials are supplied. Students will provide basic tools. glues, paints. Space is limited, so register soon. Anticipated ship date for this kit is April 7.